The Press of Robert LoMascolo: In the News! When Robert LoMascolo was in first grade, his teacher asked what he wanted to do when he grew up. Some of his classmates chose careers as firefighters or police officers, while others wanted to follow in their parents' footsteps. But LoMascolo had a different idea: He wanted to own his own museum. Now, nearly 25 years later, that dream has come true. A native of Union Springs, LoMascolo said his journey began in 2005, when he came across a bookbinding course in his first semester at Wells College. At first he was interested in fine art, but after learning how to create sculptural books, he decided to pursue book arts as a minor. Then, as with bookbinding, another class changed the course of his career: letterpress printing. 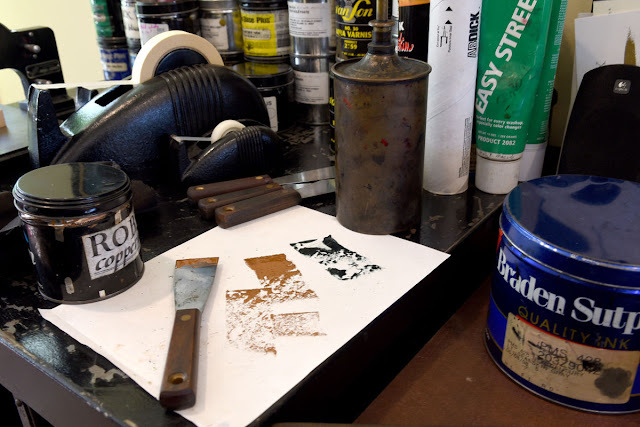 "To complete the minor, I had to take letterpress printing and I didn't really want to," LoMascolo said. "I didn't think I'd like it because I figured, 'Well, you can do all of this stuff so much easier on a computer. What's the point of using metal type?'" 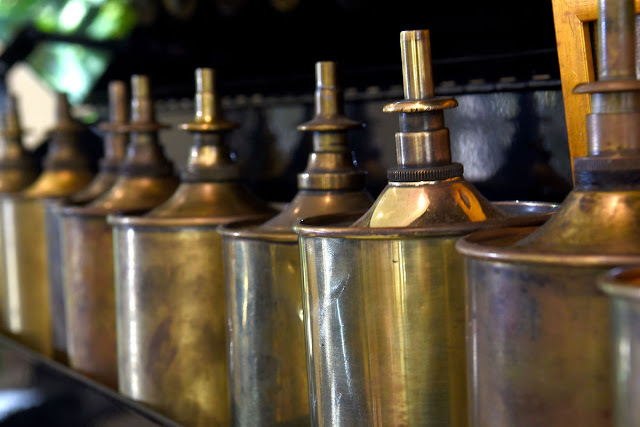 As it turned out, though, LoMascolo loved the centuries-old method, which uses heavy machinery to print from a raised surface — machinery that LoMascolo would soon start collecting. After earning his master's in book arts from the University of Alabama, LoMascolo moved back home and began searching for his first press. He found it in Oklahoma City: a 7,000-pound Heidelberg from 1968. 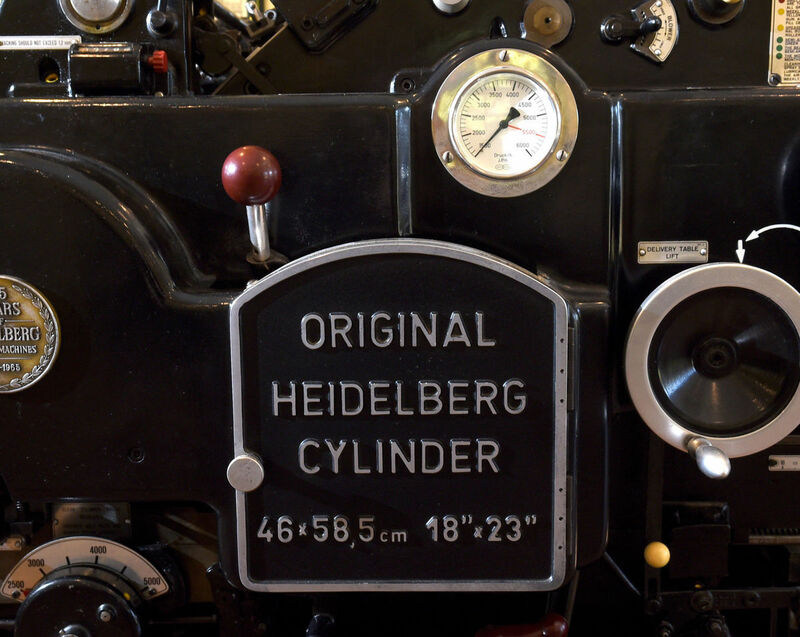 "The Heidelberg is a very late machine for letterpress printing . . . which was pretty much dead by 1970," he said. "The first press is the hardest to get, but I like to tell people it's like gravity; once you get that first heavy piece of machinery, it starts to draw others to it." After the Heidelberg, LoMascolo came across half a dozen other cast iron machines, including an 1899 press and a Vandercook Universal 4, one of only four Vandercooks Universal 4 presses that have survived to this day. Over the next few years, LoMascolo worked to restore the equipment in his parent's garage. "I was with my parents in a little one-car garage (in Union Springs) and I figured, 'If Walt Disney started in a garage, so could I,'" he said, smiling. LoMascolo said he cleaned and restored all of the machinery himself, often adding his own modern twist to make the presses more efficient. He used things like modern speed controls, computer monitors and polymer plates to merge the old and new technology, and he opened his own business: The Press of Robert LoMascolo. 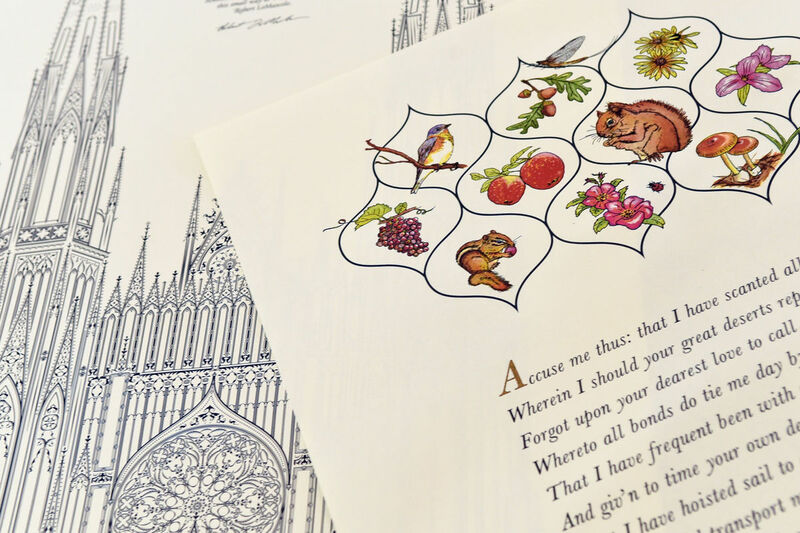 In addition to letterpress printing, LoMascolo said he does bookbinding and graphic digital design for his clients. He has also begun teaching a bookbinding course at Wells College. "I really have to wear a bunch of hats to make this work and it's not easy," he said, noting that he has clients all over the country, including The Frick Collection in New York City and the John Carter Brown Library at Brown University in Rhode Island. But one thing has made it a whole lot easier, LoMascolo said: opening his own studio in Aurora. 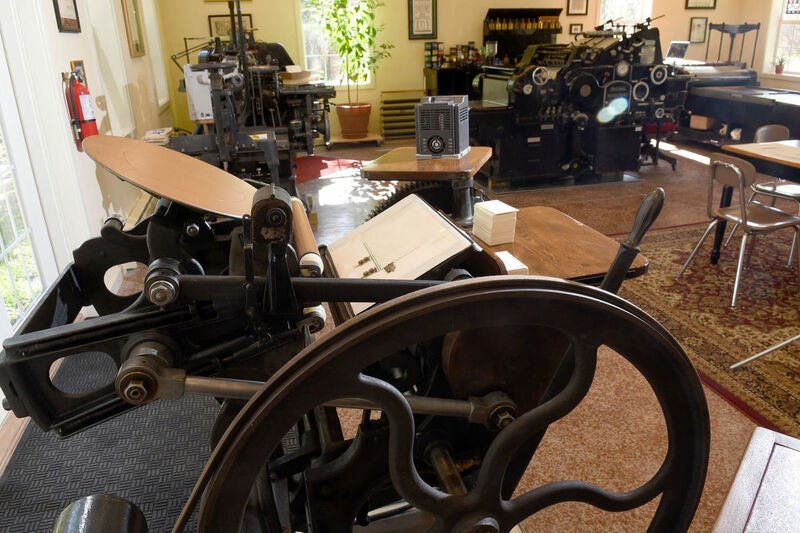 Tucked in a wooded area on the corner of Route 90 and Moonshine Road, the studio is considered by LoMascolo to be a "living museum," as people can make appointments to see some of the old presses in action. His father helped him clear the land and build the structure, which now houses over 18,000 pounds of equipment. "That was a big step forward," LoMascolo said. "My mom likes to remind me (of my dream) in first grade. . . . I guess that raised a few eyebrows at the time, but that's pretty much what this is. My own museum." Despite the digital age and his own simple start in a garage in Union Springs, LoMascolo said business has been booming. "People want to see a little bit of bite into the paper ... texture that you can feel," he said. "Some people compare it to orange juice; at one time, the best orange juice had no pulp, but now everyone wants orange juice with lots of pulp so they know it really came from an orange. 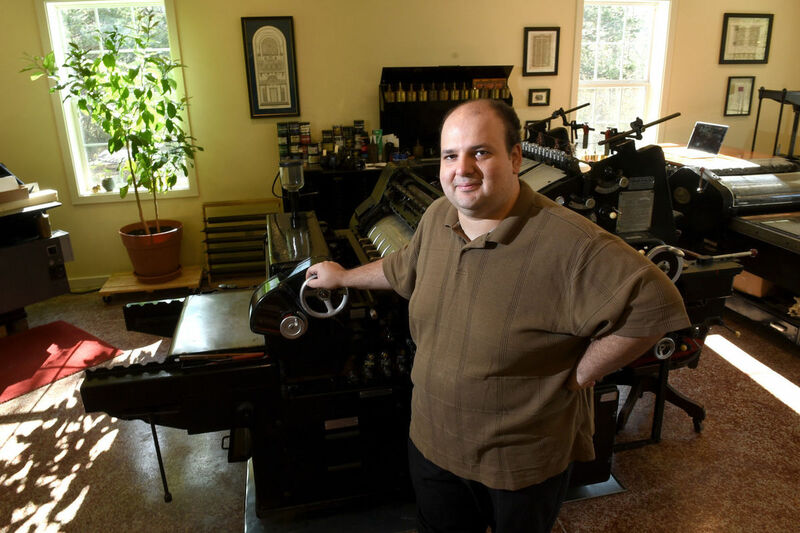 "I think the letterpress has really had a resurgence in the last decade where people are getting interested in it again," LoMascolo added. "(It is) definitely seeing it as something worth continuing."